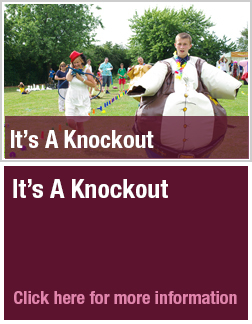 It's a Knockout events for fun days and charity fundraisers. For a perfect summer’s fun day, an It’s a Knockout Event offers everything you could want for your staff or guests from good old fashioned wet, interactive play to challenges in strength, agility and speed. It really is a great way to reward staff for their hard work and give them the opportunity to bond with people from other departments in the most entertaining way possible. Our experienced compere will guide the teams along with the support of a full events crew who will help individual participants with the games. Prior to the event our events planners will work with you to organise the running order and schedule, plan teams and assist with all the necessary documentation required to ensure an efficient and professional execution on the day. From £1975.00 + VAT - Based on 2 hours running time with up to 8 games and up to 6 teams (6-10 players). Choose up to 6-8 of the following games for your It’s a Knockout Event. If you choose wet games we suggest these are in the second half of the session. What’s not included but will be required? • You will need to have a venue, first aid support and power- and we can help you find it! • And don't forget a change of clothes and a towel if choosing wet games! "I just wanted to say a massive thank you to your staff that helped make such a great fun day! Tony was brilliant as was the entire team. They were all so friendly and enthusiastic and I couldn’t fault them for their hard work over the day. I will definitely recommend your services and hopefully next year we will be using you again!" "This is the 5th year we have used your services for our Summer Party. Each year it gets bigger and better. We know that we can rely on you deliver great Customer Service." Min 6 teams of 6. Ideally between 6 and 8 teams of 6-10 players. The games are designed for adult play – we can accommodate children or create child friendly events but we need to discuss this with you as a bespoke event. A qualified first aider must be in attendance – we can organise this for you or you can use your own provider.